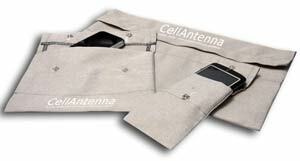 CellAntenna's RF Blocking fabric reduces or eliminates signal levels encased in it. The fabric consists of nano level copper fragments embedded into a polyester fiber. It is not a metallic fiber weave. CellAntenna can fabricate the RF Blocking material into any shape or size including clothing, liners of vehicles, draperies, and even tents. The fabric is passive and does not fall under the category of a Jammer, therefore legal to use in the United States to prevent cellular telephones from being able to communicate. - Tents over suspected bombs (quick deployment). We can fabricate the RF Blocking material into any end product.